What are some simple visual devices for unifying an image? Two effective and reasonable simple visual devices that artists use to draw together subject features in a composition are linear vectors and nodal points. This discussion focuses on these devices but mindful that the terms are not self-explanatory descriptors, I will begin by describing how they function in images. Regarding “linear vectors,” this term describes the alignment of portrayed subject material in such a way that a viewer of the image can perceive a line carried through from one portrayed feature to the next. For example, if an artist wished to portray two rectangular blocks in an image as pictorially separated from each other but conceptually linked (i.e. compositionally united) the artist would ensure that an edge of one of the blocks is perfectly in line with an edge of the other block (see illustration below). A viewer looking at this arrangement is then likely to perceive a line created that conceptually bridges the gap between them. This perceived line is what I wish to describe as a linear vector. Artists use such optically created lines (linear vectors) as a way to draw together subjects that are spatially separated and seemingly very different in physical attributes into a cohesive composition. Regarding “nodal points,” this term describes pivotal points within an image that the eye perceives as aligned with important lines, angles or intersections of the portrayed subject. Sometimes these points arise from the artist’s preliminary measuring of the subject’s proportions and are shown as small dots or “x” marks usually inscribed on the outer border of an image. 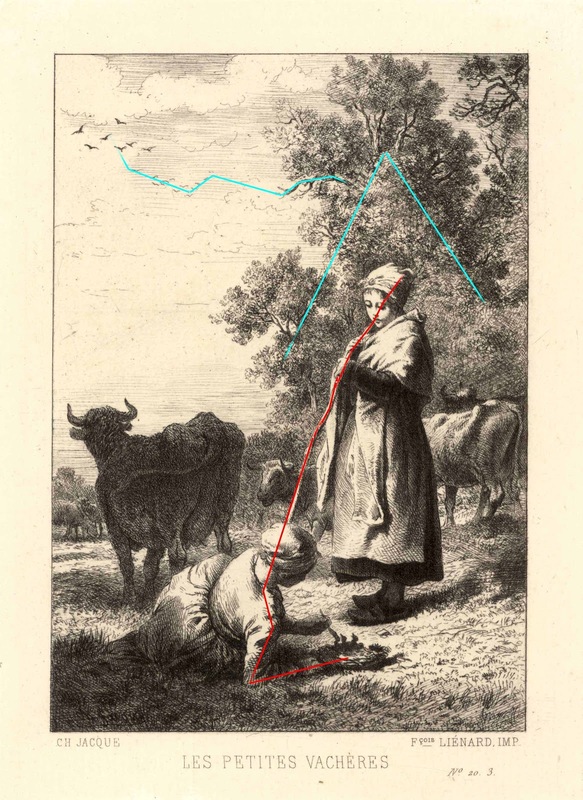 Often the marks are shown as having migrated into the picture area as well when the artist is plotting proportional measurements to accurately position the featured subject within the composition. Artists also use nodal points to show a conceptual extension of a form. 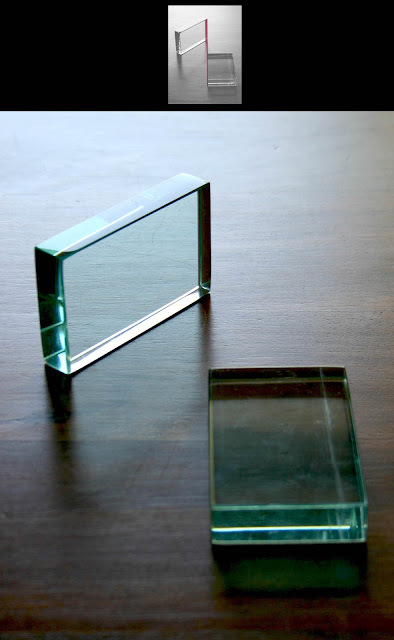 For example, in the illustration below, the upper edge of the closer glass block has been extended to its intersection with the further back block and this nodal point has been accentuated with a touch of colour. The use of nodal points also features in John’s drawing. 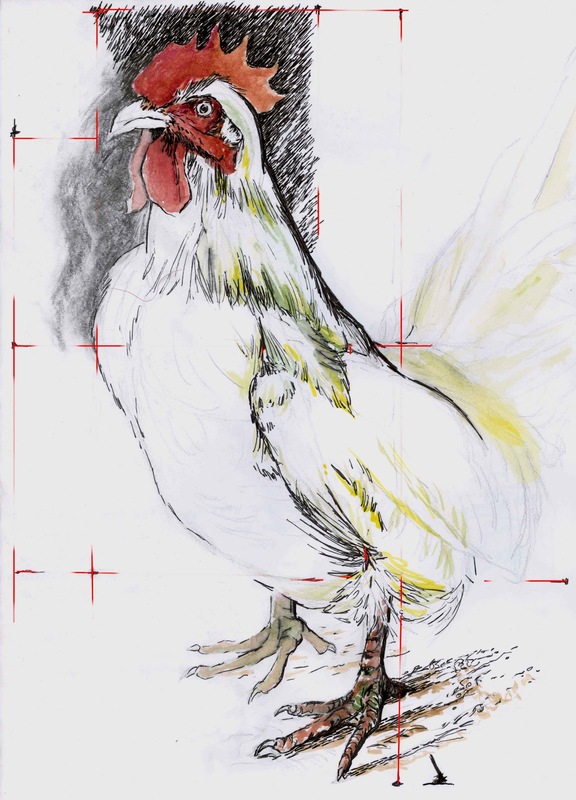 As part of the initial layout, the four sides of the drawing have been used like a ruler with sight-size notational measurements registered in pen marks. These marks guide the artist’s hand in plotting where, for instance, the tip of the chicken’s beak is to be positioned and the proportional distances between its beak, breast and hindquarters. In the diagram below the alignment of these reference points have been revealed to show where and how John established the chicken’s position on the page. From an historical perspective, the list of artists using these visual devices is considerable. Last century features Sir William Coldstream (1908–1987) with his famous “Coldstream method”—an exacting style of measured drawing continued by his pupil at the Slade, the now legendary Euan Uglow (1932–2000). 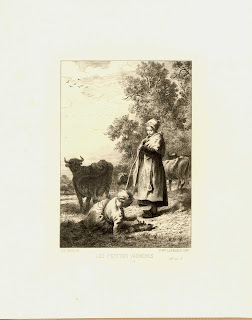 Looking back a century earlier, I have decided to focus on Charles-Emile Jacque (1813–94) and his sensitive etching, Les Petites Vacheres, to discuss linear vectors and Honoré Daumier (1808–79) with his satirical lithograph, À Bercy, to discuss nodal points. In Jacque’s Les Petites Vacheres (shown below) featuring two cowgirls surrounded by cows with one of the girls portrayed standing lightly resting on a staff while the other reclines on the ground and toys with a nest of baby birds. At first my eye is drawn to the standing girl but only momentarily as attention is soon diverted down her staff to the reclining girl. This shift in focus is not driven simply because the staff acts as a pictorial bridge between the two girls. There is more to the shift than that. This is a linear vector as the staff is aligned to connect with the reclining girl’s head and then her shoulder and finally down her arm to the nestlings (see red line in the diagram further below). The more one looks closely at this print the more connecting lines appear and they appear to be arranged intentionally. See for instance the inverted “v” shape formed in the tree behind the girl and how a dead branch from from it connects with the formation of birds flying in the far distance (see the blue lines in the same diagram below). Condition: superb impression in pristine condition. I am selling this print for a total cost of $117 AUD including postage and handling to anywhere in the world. Please contact me using the email link at the top of the page if you have any queries or click the “Buy Now” button below. 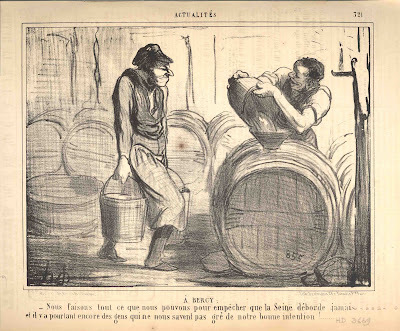 In Daumier's À Bercy (shown below) featuring two brewery workers—one carrying pails of what is probably water from the Seine towards the other worker who is pouring the liquid from a pail into a barrel—the critical visual dialogue is clearly between the two portrayed figures. 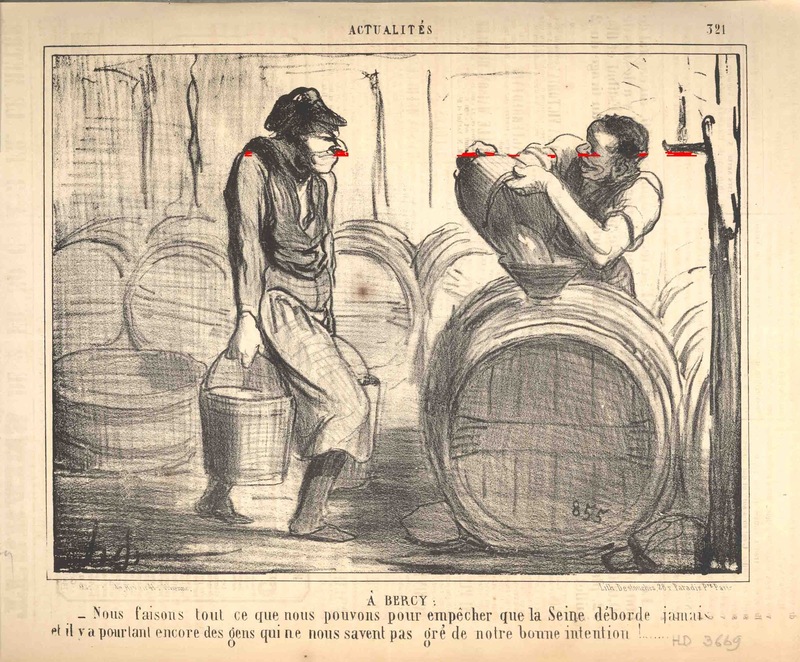 More subtly, however, there is also a potent graphic dialogue between the horizontal line created by the pointed nose of the figure carrying the pails and a horizontal line aligned with and pointing back to the same figure’s nose created by the candle support on the far right edge of the image. This alignment is planned and it is all to do with a carefully placed sequence of nodal points. For instance, in the diagram further below, see how the line from the candle support is perfectly level with the other figure’s nose and hands. This subtle graphic exchange between all the pointy bits lies at the heart of what makes Daumier’s satirical style of drawing so engaging to look at. Condition: crisp impression, attached by hinges to grey support paper, slightly dusty and imaged with a few spots and light age toning. I am selling this print for a total cost of $94 AUD including postage and handling to anywhere in the world. (The print is large and will be posted in a tube.) Please contact me using the email link at the top of the page if you have any queries or click the “Buy Now” button below.